While we're still marking this as rumour alert, a Holt Renfrew insider has told DigitalJournal.com the luxury retailer will be carrying Apple's iPhone across Canada by mid-October 2007. Digital Journal — The Apple iPhone is arguably this year's hottest gadget, but until now there has been no news about when the popular phone would be available in Canada. Both Apple and Rogers (the suspected carrier) are notoriously tight-lipped. When the iPhone was launched in the U.S., Canadians were left out in the cold and Apple fans outside the U.S. have cried themselves to sleep for months. However, DigitalJournal.com has learned from an inside source at Holt Renfrew that the luxury retailer will have the iPhone in about two weeks. We have to say this is still in rumour phase, as Holt Renfrew's publicity department would not confirm it with DigitalJournal.com. However, the source inside Holt Renfrew was adamant the phone would be arriving shortly, after speaking with the retailer's buyers. If the rumour is true, it would be the first confirmation of the iPhone's arrival in Canada. The Holt Renfrew source says the 8GB phone will be a GSM phone, retailing across the country for $799. Anyone familiar with the GSM market in Canada knows that Rogers is the leading GSM provider in the country. Launched in the United States in June, the iPhone re-ignited the iPod-era Applemania. The company announced on Sept. 10 it had sold its one millionth iPhone, and later followed up by announcing a Nov. 9 launch date in UK, and Germany. A Rogers customer service employee let news slip the company would have the iPhone exclusively in Canada back in January, which the company retracted a week later. A DigitalJournal.com Citizen Journalist (Sarawanan Ravindran) reported more feedback from Rogers in June, when the carrier confirmed once again it would be have the iPhone exclusively in Canada. 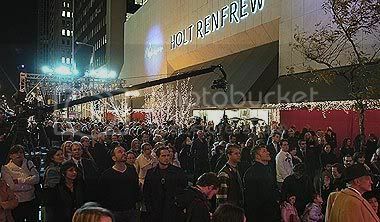 When DigitalJournal.com approached Rogers for comment on this Holt Renfrew news, the company would not confirm or deny anything. "The iPhone is a phenomenal product and at Rogers Wireless we look forward to being able to offer it in Canada. When we have a public announcement to make, we'll let you know." Apple did not return our calls for comment. For all Canadians hoping to get their hands on the iPhone, here's hoping this rumour is true. UPDATE: We have learned new information from Holt Renfrew's executive director, Mario Manza. Scroll down to comment #11 for full details.